Since we were in the vicinity, rif and I decided to go to JM Bariani House for lunch. The restaurant is tucked in a row of shop houses at SS18, Subang Jaya. Thank goodness for air-conditioning, as it was really hot outside! 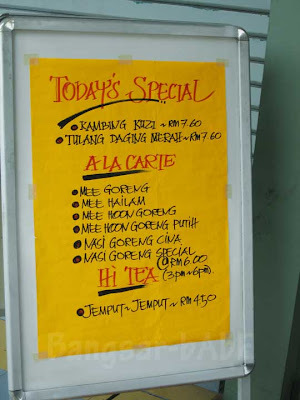 They serve nasi bariani gam ayam (chicken) on Wednesdays and nasi bariani gam kambing (lamb) on Saturdays. We were there on a Sunday afternoon, so only the normal bariani was available. 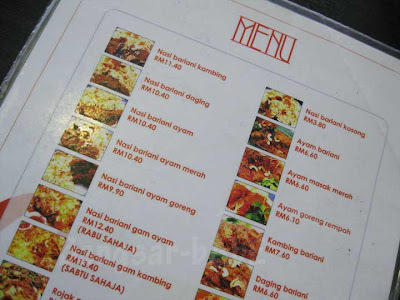 I ordered the lamb bariani (RM11.40) while rif had the chicken bariani (RM10.40). 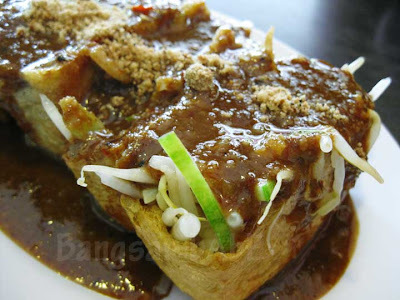 We also shared some tauhu bakar (RM4.50), which was fried bean curd skin stuffed with bean sprouts, cucumber, mengkuang and chunky peanut sauce. The rice was fragrant from the use of ghee and spices. It was also moist, well separated and fluffy. The rice grains are shorter and rounder compared to the one at Sri Ghazal Briyani. I stole a bite (OK, maybe more than one bite) of rif’s chicken, and it was quite good. 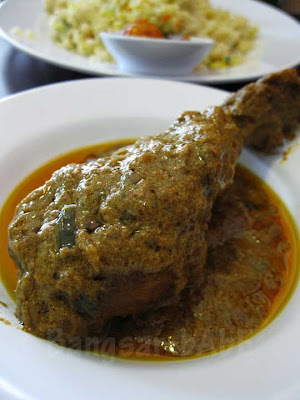 The gravy was hearty, spicy and infused with aromatic spices, and the chicken was nice and tender. But the star of the meal was definitely the lamb. Cooked for a few hours, the meat was fork tender, and easy to pull apart. The gravy was dark and rich, with the right balance of flavours and spices. There was also no gamey taste or smell in the meat. Two thumbs up! I love pickled fruits so naturally, I enjoyed the acar buah. rif didn’t care much for acar, so I got to eat his portion too. =) The dalcar was tastier than the one we had in Sri Ghazal. This version was thicker and more flavourful. I found the tauhu bakar average. It was crispy on the outside and the vegetables were crunchy and juicy. 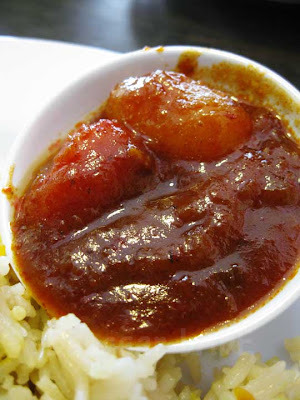 Hoverer, the peanut sauce could have been a bit spicier – this was too mild for me. The Sirap Bandung (RM3.50) was overrated. It tasted very watered down. rif (who tried it before) told me the standard has dropped. Our bill came up to RM33.40 inclusive of 10% service charge. Not cheap, but I think it’s hard to find cheap and good briyani/bariani/beriani (which one is correct?) these days. 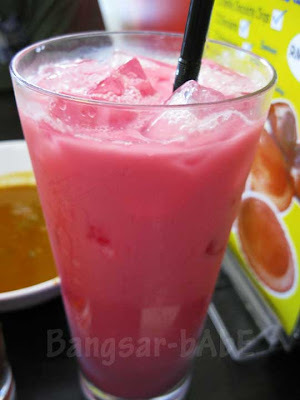 The colour of sirap bandung always scares me off. But the lamb really looks tempting, wanna try it out. And the taufu bakar, gosh, haven't had them for ages. Miss them so much! You really like briyani don't you. There's quite a few briyani joints you've been. 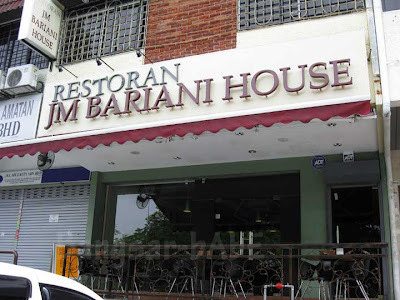 I have tried JM Bariani on several occasions at their outlet in Shah Alam. On a few occasions, their lamb was way too tough and fatty, plus had the pungent odour of the meat. Prefer their beef. JM's beriani rice is of the 'lighter' type of beriani rice, compared to my two fav houses, Kayu Nasi Kandar and Pelita. But it is an interesting alternative occasionally. 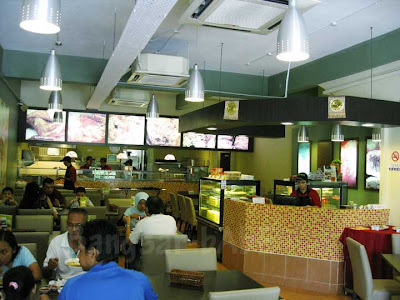 DF – I've never tried the Shah Alam branch, so I can't make any comparisons. But the lamb I had was really yummy…tender and not gamey. I only take pork & chicken… lol!!! 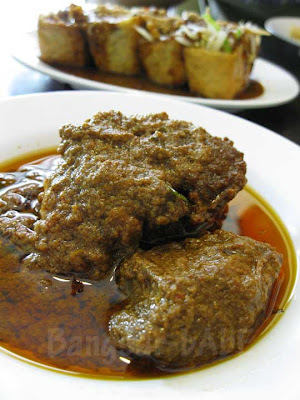 Cumi & Ciki – Tempting hor? 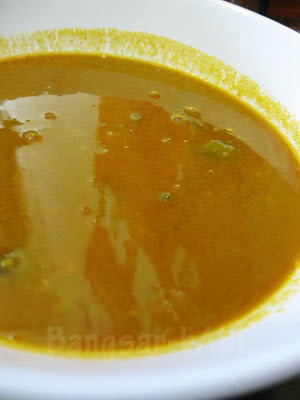 Come we go…I want to try bariani gam this time! How u can keep ur body slim by eating so much good food? 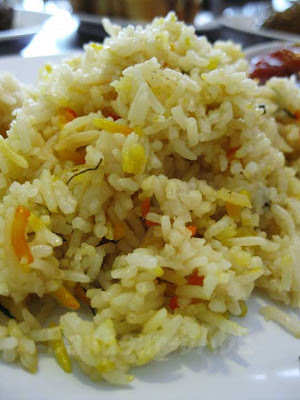 they did not used the Basmathi rice which are long, whole grain and flavorful. boss took here once..its like a neighbourhood restaurant rite? found it pretty good too..
Joe – Yup…it's in a neighbourhood. foodbin – I don't think they did. My have my beriani fix near my house but taste ordinary. 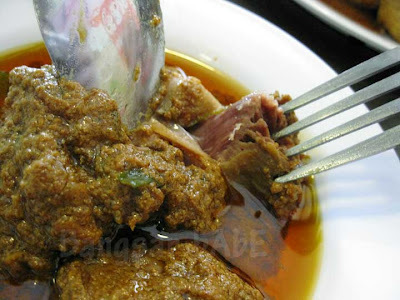 I like the lamb with lots of gravy from good beriani place. yayaya..mayb jz for the lamb..but SS18?? haiizz..
here is better than at Mydin USJ. the taste of lamb was same. delicious. BUt surely i'll sleep early on that night. You can get the tahu bakar at taman melawati pasar ramadhan only RM1.50 and the best so far i've tested in Malaya. Serious babe. I find beriyani at JM way overrated. Case of reputation preceding itself. Kinda like nasi lemak kampung baru. All hype only. Not terrible tasting, but nothing special either. Definitely a must try. JM beriani never fail me. 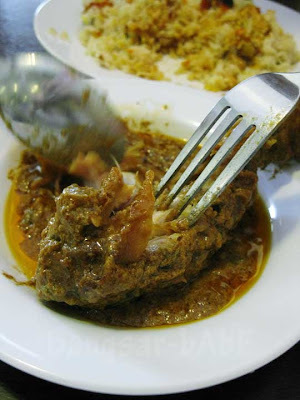 Always delicious and my family love their rosemary fried ribs with nasi beriani.